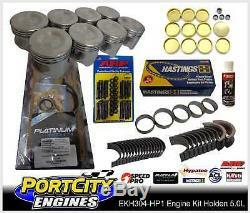 Engine Rebuild Kit Holden V8 304 5.0L Commodore VN VP VR VS EFI HP1 Series. Best quality, best value, best service! 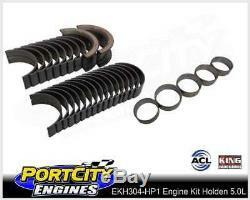 HP-series engine kits are designed to transform your tired old 304/5.0Lto better than new. This is a top-quality precision parts kit, we refuse to substitute rubbish parts for price! Product Line: Hypatec, Hastings, Speed Pro, ARP, King/ACL, Platinum/AAP. 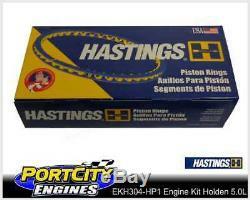 Part #: Rings: Hastings/Speed Pro Brand Cast Ring Set. Part #: Bearings: King/ACL Main & Conrod bearings supplied. Part #: Bearings: ACL/Durabond Cam bearings supplied. 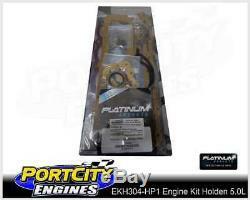 Part #: Gasket set: Platinum Full Gasket set with head gaskets & seals. Part #: Welsh plug Kit: Contains: 10 x 1-5/8 Brass Plugs, 1 x 1-13/16 Steel Cam Plug, 3 x 39/64.610 plugs & 1 x 3/8 NPT Pipe Plug. Part #: Conrod Bolts: ARP 8740 Chromoly Steel Conrod Bolts 3/8. Part #: Assembly Lube: Speed-Pro Assembly Lube 8oz Bottle. Application: Holden V8 304 5.0L EFI Petrol Engines. Application: Holden Commodore VN, VP, VR, VS & VT models 08/88 06/99. Application: Holden Statesman VQ, VR & VS models 03/90 06/99. Notes: Dish top 10.0cc pistons, 8.82:1 comp/ratio with 61cc heads (VN - VS). Notes: Dish top 10.0cc pistons, 8.91:1 comp/ratio with 58cc heads (VT). Notes: Specify make, model and year for correct parts. Notes: Specify Bore & Bearing Sizes when ordering: STD. We normally stock most sizes. 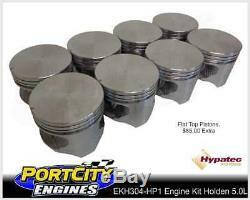 Includes: Crank, Pistons, Conrods, Balancer, Flexplate or Flywheel and Clutch pressure plate. Direct Bank transfer Prefered - (Discounts may apply - check Item description) details: National Australia Bank. 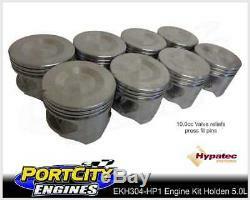 Port City Engines strive for 100% satisfaction with our products. Share your concerns and we will find a solution satisfactory to you. Welcome to Port City Engines. With more than 25 years in business, we are proud to have earned the recognition as being an industry leader in the field of engine machining, balancing, engine development and quality parts supply. Please visit our website to learn more about us, our quality standards , our products and our services. 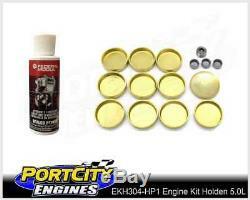 The item "Engine Rebuild Kit Holden V8 304 5.0L Commodore VN VP VR VS EFI HP1 Series" is in sale since Wednesday, December 11, 2013. 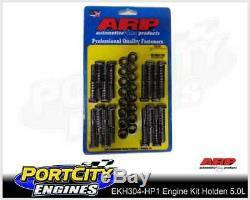 This item is in the category "Vehicle Parts & Accessories\Car & Truck Parts\Engines, Components\Engine Rebuilding Kits". The seller is "portcity05" and is located in Portland Vic 3305. This item can be shipped worldwide.